We had a project where Structural Columns had been drawn as Architectural Columns. From the below mentioned problems - some-differences-between-columns. we wanted to change them all over to Structural Columns. On first looks there is no easy way to change Architectural Columns to Structural. Using the Copy/Monitor tool was the quickest way of doing it. A sketch mode will open up. Go to options and select the columns you want to replace with what. 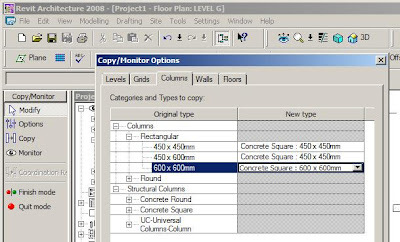 Click ok.
Then use the Copy tool and select your current Architectural Columns. Finish out of Sketch mode. Select all the Architectural Columns and delete them. Then select the new structural columns and deselect the monitoring tool in the options bar.